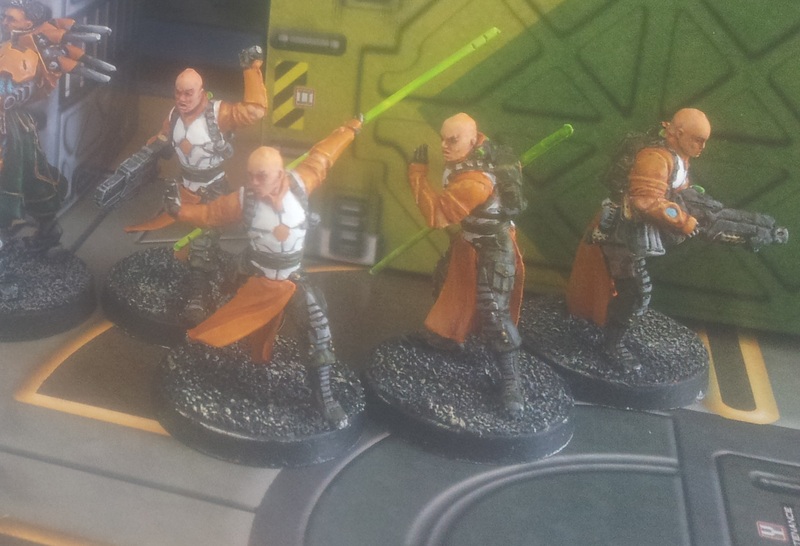 The Shaolin warrior monks was a set of models I just had to have even before I understood the rules, and a quick glance at the homepage is enough to see that I am happy with how mine turned out. I actually repainted those guys recently, after I discovered the magic of scrofulous brown. 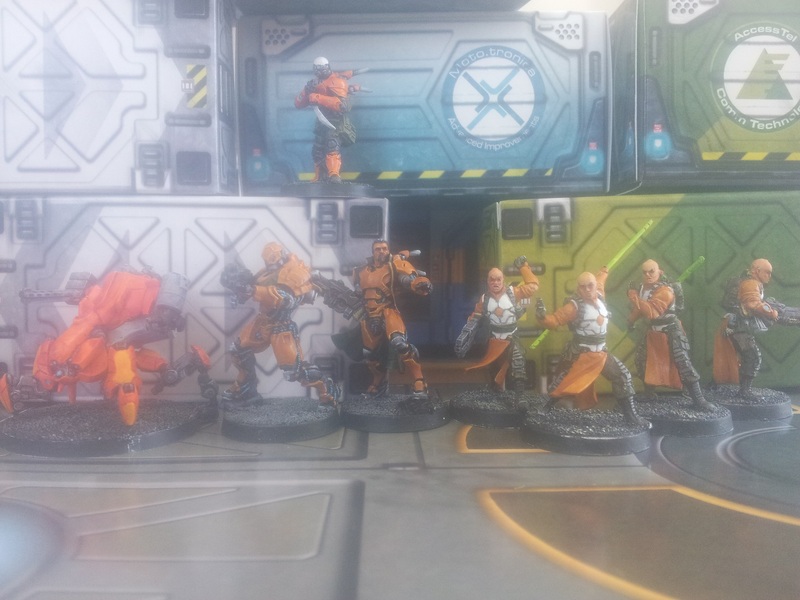 My first infinity figures were painted in a much brighter, more vibrant orange not unlike a traffic cone. This was achieved by painting Games Workshop Firey Orange (long discontinued) over a white undercoat (ugh), then washing it liberally with Baal Red (recently discontinued). I quiet like how the orange turned out, especially on my remotes. But on the Shaolin it always reminded me of a hi-vis raincoat. Once I finished painting Sun Tze and saw how awesome he looked in matching duds with the ZuYong Invincible, I knew one day I would be redoing my Shaolin to match. I was absolutely loath to strip them for fear that the brushing could bend or snap the shock staves, and although the orange robes are striking, they are a fairly small part of the model. The open gong fu poses on all but the much maligned combi-rifle figure also made access fairly easy to do without taking them to bits. 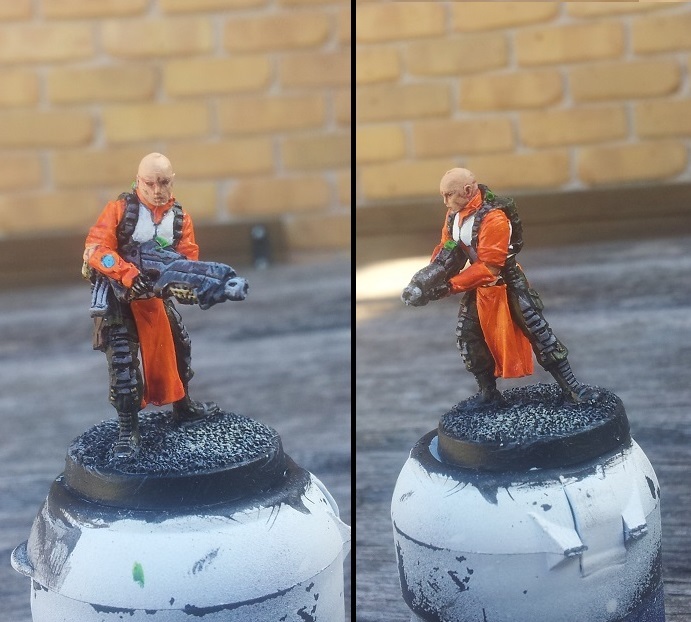 I painted over the robes very similar to my usual orange, but played with the order a bit to distinguish the fabric of the robes from the armour of the heavy infantry. First I painted the cloth orange brown, then washed it with cavalry brown, same as before, but then without doing the white highlights, I did a layer of scrofulous brown, then washed it again with the cavalry brown. Then a smaller layer of scrofulous brown was applied, and the extreme edges done in a mix of scrofulous brown and skull white. I’m not sure how much of that was necessary, I winged it on the first guy and then did it on the others to be consistent. As I wrote earlier, I didn’t hate my first attempt at all, but I feel the new look works much better. Encouraged by this success, I would later redo the armour on my Gui Feng spec ops, but that will have to wait for another post.